The Northern Nationals, the fifth race on the eight-race 2019 Professional Drag Racers Association (PDRA) Tour, will be presented by Callies Performance Products, PDRA officials announced today. 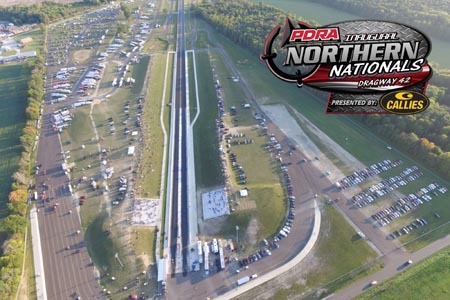 The inaugural PDRA Northern Nationals presented by Callies Performance Products will take place July 18-20 at Dragway 42 in West Salem, Ohio. "It's exciting for us to enter a new market, northern Ohio, with the support of Callies Performance Products," said Will Smith, marketing director, PDRA. "Callies is a new PDRA sponsor for the 2019 season and we couldn't be more pleased to have them on board as the presenting sponsor of the Northern Nationals." Located in Fostoria, Ohio, Callies Performance Products designs and manufacturers a wide-ranging line of engine components, including crankshafts, connecting rods and camshafts. Callies products are used by a number of teams across the PDRA's professional and sportsman categories, especially the highly competitive Switzer Dynamics Pro Nitrous. "We have a ton of customers in the PDRA, so it just made sense to partner with the PDRA for the Northern Nationals," said Brook Piper, sales & tech, Callies Performance Products. "Now that we're also making spline post crankshafts for the blower guys, it felt like now is the right time to hook up with the PDRA and their growing brand of Pro Modified racing." As a part of the presenting sponsorship, Callies will have a product display tent on the midway during the Northern Nationals. Many local Callies employees also plan on attending the Northern Nationals. "Everyone here at Callies follows Pro Mod racing because these are the racers who use our products," Piper said. "Now that the PDRA will be in our backyard, our employees will get to meet some of our customers and see our products in action." Callies Performance Products' sister company, Energy Manufacturing, has also signed on as a PDRA Series Supporting Sponsor. Energy Manufacturing's performance products - billet blocks, intake manifolds and cylinder heads - are engineered to perform reliably in high-horsepower naturally aspirated, nitrous-assisted and boosted applications. "Energy manufactures products that a lot of our Callies customers use, especially in PDRA where they're allowed to run a billet block and billet heads," Piper added. "It was just the right fit for them to also be involved in this type of racing."